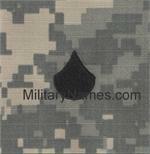 ACU UCP GORE-TEX NAME TAPES Military Name Tapes & Rank Insignia. Leather Flight Badges for all Branches of Service. Embroidered 1/2 inch strips with 1/4 inch Black lettering on digital ACU pattern for Gore-Tex jackets.